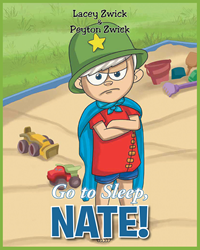 “Go to Sleep, Nate!” from Christian Faith Publishing authors Lacey and Peyton Zwick is an enjoyable narrative depicting a toddler’s efforts to never sleep by making up excuses. “Go to Sleep, Nate!”: a wonderful and relatable account that readers will surely find enjoyable to share. “Go to Sleep, Nate!” is the creation of published authors, Lacey and Peyton Zwick, a mother-and-son tandem. “‘Nate! It’s time for bed!’ Mother exclaims. Published by Christian Faith Publishing, Lacey Zwick’s new book is a fun way of imparting to children the importance of sleep in their growth and health. It’s also about a mother who learns through her boys, unexpectedly, that she is unconditionally loved as well. This tale, based on the Lacey’s youngest son, shows a child’s playful nature that only parents can love and cherish for a lifetime. View a synopsis of “Go to Sleep, Nate!” on YouTube. Consumers can purchase “Go to Sleep, Nate!” at traditional brick & mortar bookstores, or online at Amazon.com, Apple iTunes store, or Barnes and Noble. For additional information or inquiries about “Go to Sleep Nate!”, contact the Christian Faith Publishing media department at 866-554-0919.